They’d know what love looked like. That sound made sense to me when nothing else did. Because it was upside down. She made the ordinary , extra in my mind. Yet the butterflies in my belly told me something else. This is super cute, ah. ‘Vishu’. Its a cultural festival in India celebrated mainly by Keralites. It signifies the beginning of a new year. Bursting crackers, getting ‘vishukaineetam’- basically money from elders and so on. In my 18 years I’ve never burst crackers or had any authentic vishu celebrations because I was in an Arab country. But this year,2016, marked a new year for me. I burst crackers for nearly 2 hours. Various kinds of them infact. Such a lovely day of laughter and joy. 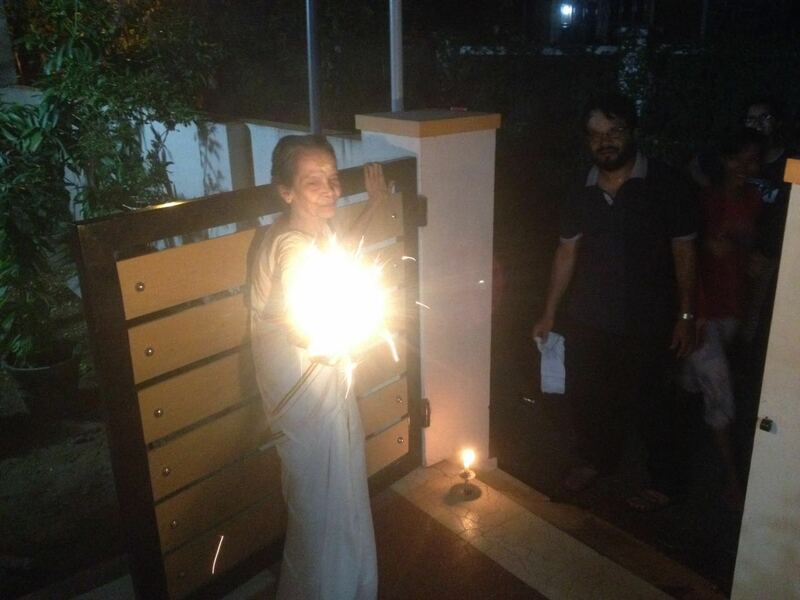 The greatest moment though, was when the person who taught us all the meaning of vishu and most importantly, how to correctly light up crackers, persuaded by all of us, lit a cracker for herself after a really really long time. It really makes you wonder doesn’t it? Somethings don’t change. Crackers made her happy then, they make her happy now. Maybe traditions aren’t such a bad thing after all, is it?